Welcome to Beverly's Booth maintained by BLKGLASS! I included various logos in my booth banner so you would recognize me. I have used the logos on glass research sites, selling sites as avatars and on glass chat areas. The majority of the offerings in this booth are glassware made from 1920-1970. 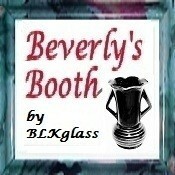 Booth items labeled " Beverly's Black Glass " are from my black glass collection. I am an avid collector of Black Glass and Black Amethyst Glass from the 1930s and 1940s. For over 10 years I maintained a website highlighting black glassware at http://www.BlackGlass.com. The website is temporarily closed for reorganization. I have been an online seller for many years. I have a reputation for accurately describing items, excellent packing and timely shipping. I am also a member in good standing of the GPSA Glass & Pottery Sellers Association. I am located in eastern Nebraska which is far from most of you, so I have not scheduled a Bonanza Pickup date. If you purchase multiple heavy items in one purchase, I am certainly willing to work with you in arranging a pickup date and time. On Bonanza I have 3 booths, all offering the same great service. I have closed down my BlackGlassWebsite for reorganization. If you would like to receive a notice when I add items weekly, go to my booth, go to the Booth Toolbox on the left and side. Click 'Subscribe To Feed'. I Hope you enjoy your visit and that you come back often. BLKGLASS doesn't have any items in their booth! one of the most honest, kindest, knowledgeable persons dealing in Black Glass. A fair & reputable dealer. One should rest assured when purchasing from this seller. A very knowledgible and helpful seller to me concerning glassware. A fine and honest person.